The biggest challenge in a homebrew lighting system is the headlight mounting to the bicycle. Prior to the popularity of threadless headsets*, a front reflector bracket was standard equipment below the big headset nuts, or could be easily added. 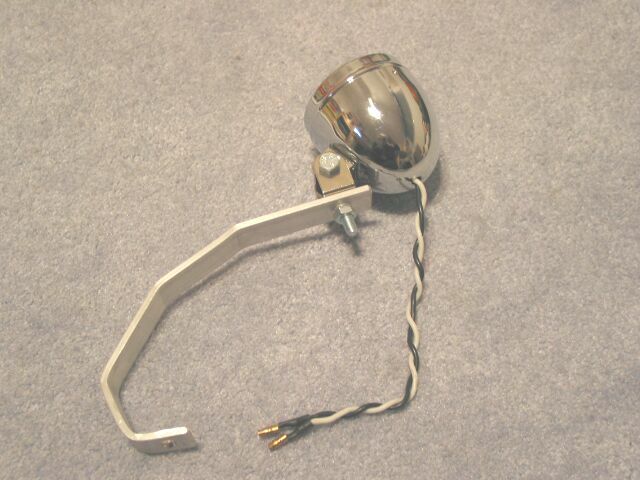 This made an ideal mount for headlights; it was ideally positioned, it facilitated a very secure mount, and it did not add to handlebar clutter. It was usable on road bikes with taped or foamed bars because it did not depend on a clamp that only worked with a specific diameter of bars. Except for higher end touring and road bikes, most new bikes now use the cheaper threadless headsets which cannot use the headset mount reflector bracket. There are also brake bolt mount steel reflector brackets that will work just as well, and plastic brackets that are okay for lighter headlamps. 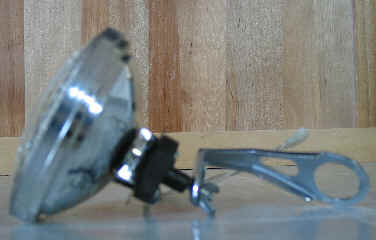 Note that all bicycles sold in the U.S. still require a front reflector however the mounting may no longer be sturdy enough to mount a headlight on. If it is a piece of steel attached the brake bolt then it's fine. It it's a thin plastic loop clamp or other plastic part, then forget it. Note that you can always buy a piece of aluminum bar and build your own brake bolt mount bracket that fits your particular bike (just bend the aluminum bar to the proper shape in a vise, and drill the appropriate holes). Try to avoid using radiator hose clamps. *Try to avoid buying bicycles with threadless headsets. The reason for these headsets is that it makes it easier for bicycle manufacturers and shops because they no longer have to stock different lengths of forks (they simply saw the fork to size). You lose height adjustability of the handlebars with these headsets, unless you use a funky extender. Threadless headsets are in the same category of aluminum tubing and compact frames. They save money for the manufacturer, but they are bad for the end user. Amusingly, now bike manufacturers are touting "adjustable stems" as a feature, on bikes where they went back to threaded headsets. Remove the front reflector and mount the headlight to the front reflector bracket via an insulator. This avoids the need for funky handlebar clamps, and eliminates handlebar clutter. If your bike doesn't have a front reflector bracket then you'll need to buy one at a bike store or come up with some other mounting method. You can add a reflector bracket to threaded headsets but not to threadless headsets (you will need a headset wrench). For the Micro Beam driving lights you may need to fasten it to a rectangle of wood or metal to make the mounting holes line up with the reflector bracket. The top of the line Nitto front rack has an integral mount for a headlamp. Commercial reflector bracket for brake bolt. You can bend and drill your own from a section of aluminum flat (Home Depot). I don't know where you can buy one already made. Avoid 90° bends in aluminum flat bar, follow the example above. The bracket goes under the steering tube and is fastened with a bolt through the brake bolt hole. Most forks still have this hole, even though it isn't used for brakes any more (some fenders use it). Home made reflector bracket for brake bolt made from a piece of flat aluminum with a QH-7CC driving light attached to it. Don't do 90 degree bends as this will weaken the aluminum. The bend at the bottom of this bracket is about 65 degrees. 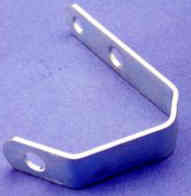 Commercial reflector bracket for a threaded headset. A bike shop will sell you this very cheaply if they still have any! Not usable with threadless headsets which are on most mountain and hybrid bicycles. Dimension Front Reflector Bracket. This would be fine for a single plastic sealed beam, or a single MR16 or MR11 lamp, but not much more. $2.95 from bikeman.com. 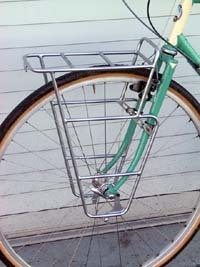 Nitto steel front rack has a mount for a front headlamp. $128 This bicycle has an old-fashioned headlight mounted to a threaded headset bracket. That looks like a very useful bracket, but I have no idea where to buy such a thing. This bicycle is a typical Japanese village bicycle so try a bicycle shop in any small town in Japan. You must fabricate a non-conductive mounting fixture that screws onto the sealed beam through the holes in the tabs. Basically you need a round circle of wood with two holes for the bolts for the tabs and one hole for the bolt that goes through the hole in the reflector bracket. The fork lugs from the headlight harness attach to the two bolts that go to the tabs; this is how current goes to the headlight. Use 8/32 by 1/2" to 3/4" long bolts. The headlight comes with the right diameter screws but they are too short. However you need to use the screws it comes with to tap holes into the tabs, then remove them and use the longer screws. 14W Sealed Beam attached to an wood insulator (black), attached to a headset mount reflector bracket. A wing lock-nut is used for easy on-off without any danger of the nut vibrating loose. Simple, secure, very light, weatherproof, and not clamped to the crowded handlebars. A brake bolt mount reflector bracket could also be used. See the knob at http://store.yahoo.com/dlawlesshardware/woodknobsolb.html, which may work, but the shipping is high. If you are doing a dual system then forget about this and just use a rectangle of wood. Cover the wood with black heat shrink tubing if you wish. My latest system is a dual 14W system for which I used an 11" length of 2" wide oak strip that was about $1 from Orchard Supply Hardware. I get about 1.75 hours of run-time with both headlights and a 1.8W strobe, on a 12V 5AH sealed lead acid battery. Recharging a completely discharged battery takes about six hours with a 900mA charger. Drill two holes in the flat part to match the holes on the sealed beam. Drill the center hole of the knob all the way through, countersink the top, and insert a long bolt all the way through (before you fasten the sealed beam to the knob). Then you use a lock nut (I used a wing lock nut) to secure the headlight assembly to the front reflector bracket (bend the reflector bracket to aim the light). If you don't have a front reflector bracket then you can buy one at a bike store for a dollar or so, but all bikes sold in the U.S. have front reflector brackets. If you want to mount the lights or switch box to your handlebars then you will need some clamps. Remember, when choosing the proper size that the McMaster catalog diameters are inner diameters of the conduit or tubing. Measure the diameter of the tubing you're using with a vernier caliper. Choose the outer diameter that is the closest to the diameter of your tubing (choose a size equal to, or a bit smaller than the diameter of your tubing). These clamps have an advantage over conduit clamps because the attachment point is in the center. For example, if you want to hang a 2" deep plastic enclosure from your top tube it will not be possible with a U bolt or conduit clamp because they are too wide. Choose stainless steel, with mounting plate, 1/4"-20 thread size, with dimensions A=1.75", B=1", C=1". Slip a piece of 1/4" rubber hose over the unthreaded section. $12 for 5 pieces at McMaster. These are available at hardware stores, or from McMaster (must buy a package of 50 from McMaster). These are available in the electrical section of hardware stores, i.e. Home Depot. Use a strip of rubber to ensure a tight fit (or heat shrink a piece of tubing around it). Steel clamps are also available. Remember that the size printed on the package is for the INNER diameter of the conduit, a 1/2" clamp is closer to 3/4", a 3/4" clamp is closer to 1". Conduit clamps attached to a rectangle of aluminum or wood, with the lamps attached to the rectangle, provide a secure, inexpensive mounting to the handlebars (some spacers or extra nuts on longer bolts may be needed to clear the handlebar bolt to the stem). Zefal Gizmo Clamps are good for attaching accessories to the frame, but even the smallest size is too large to use on the handlebars. These are used to secure fishing rods to 7/8" round rails on boats. Probably about the most secure and painless way to attach a light fixture. Available with 1/2" threads. You will have to buy the proper length and threading of bolt, as the bolts that come with driving lights are too long and are probably threaded differently. A variety of headlight mounting hardware can be seen and purchased from Peter White Cycles. He has brackets that attach to the brake bolt of various types of brakes, as well as a handlebar bracket. These brackets are designed for Lumotec headlights, but you should be able to adapt them for your own use.